Mondrian began his career painting landscapes in his native Holland. By the 1920s he had evolved his mature style, in which rectangles of white—here two subtly different colors of white—are banded in black, and juxtaposed with smaller rectangles of the primary colors: red, yellow, and blue. 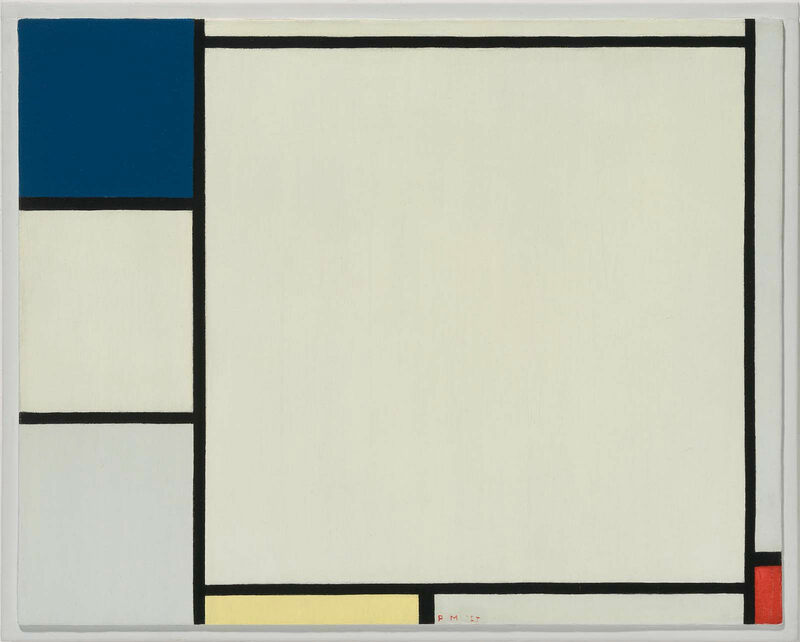 This canvas is the first painting by Mondrian to enter the Museum’s collection. Mondrian exhibited the work in Paris on March 12, 1927, at the Parisian Hollandsche Schildersvereeniging (Painters' Association) evening exhibition. In May of that year, this was one of four works he consigned to the Kunstausstellung Kühl, a Dresden art gallery. Joop Joosten has tentatively identified the present painting with that mentioned in a letter by Mondrian of May or June, 1928: "…I sold an old canvas, that is, one of last year's, to a German sculptress who came to me with an introduction from Mad[ame] Küppers and Lissitzky." The painting was shown at the 1929 "Stuhl-Ausstellung" held at the Kunstgewerbemuseum, Frankfurt (March 10-31), along with other Mondrian paintings in Germany at that time. See Joop M. Joosten, Piet Mondrian: Catalogue Raisonné of the Work of 1911-1944, vol. 2 (New York: Harry N. Abrams, 1998). They lent the painting to the exhibition "Piet Mondrian: Paintings, 1910 through 1944," Sidney Janis Gallery, New York, October 10-November 12, 1949, cat. no. 21. According to a label on the reverse of the frame, Mr. and Mrs. Ladas lent this to the Mondrian Retrospective, Washington Gallery of Modern Art, May 8-June 20, 1965 (not in catalogue). Joosten 1998 (as above, n. 1) notes that the painting was in a private collection in 1960; this may be Mr. Ladas, who was also listed as the owner by Maria Grazia Ottolenghi, L'opera complete di Mondrian (Milan: Rizzoli, 1974), cat. no. 375. Included in the exhibition "Mondrian: An Exhibition of Paintings and Drawings, 1900-1944," Sidney Janis Gallery, New York, February 21-March 29, 1980, cat. no. 13.